The sun may be lighting up the sky in a spectacular display of color, but there’s another reason why nobody’s sleeping in this morning. Some mother’s child is upsetting the peace and quiet of the marsh with incessant whining. Good grief! 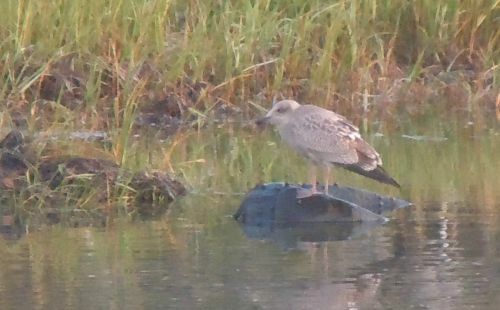 Despite its camouflage plumage and the low light, it’s easy to see from where the annoying whining is originating. I’ve caught this act before. 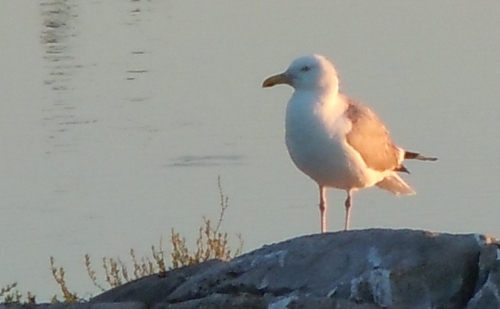 It’s not unusual to see immature seagulls pestering adults for food. 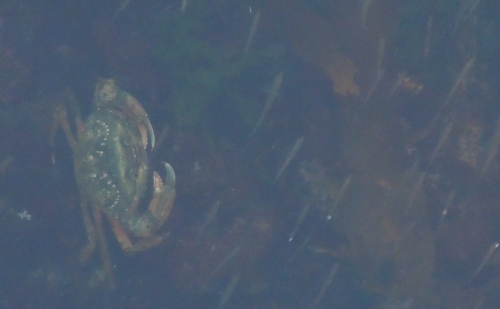 It’s an odd sight as some of these juveniles appear just as large as the parent. The whiner’s mother is of course ignoring it and pretending it’s someone else’s offspring that’s waking up the entire neighborhood. What’s a parent to do, especially with a child that should be old enough to fend for itself? ‘Feed the brat! 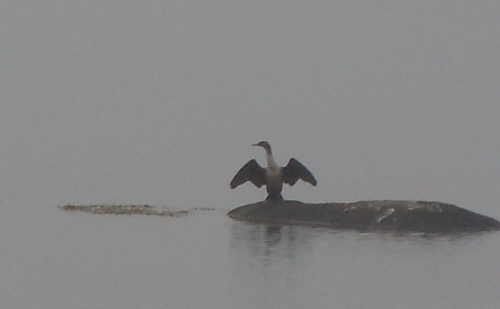 !’ the cormorant suggests. But is that really the best solution? Don’t give in to whining. Giving in teaches a child that whining is the sort of behaviour and tone of voice that will generate a result. Okay, so you don’t give in. But surely there has to be a way to make it stop. 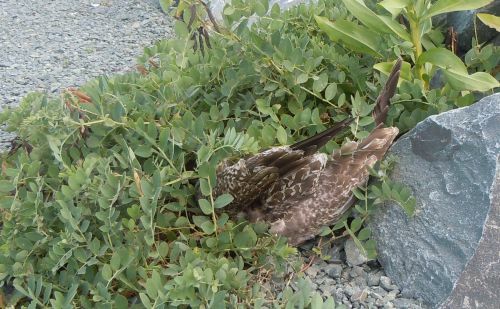 Late last week I came across the carcass of a juvenile gull along the trail. Did the eagles take matters into their own hands talons that day? Who knows? Unfortunately, what goes on in the marsh stays in the marsh. 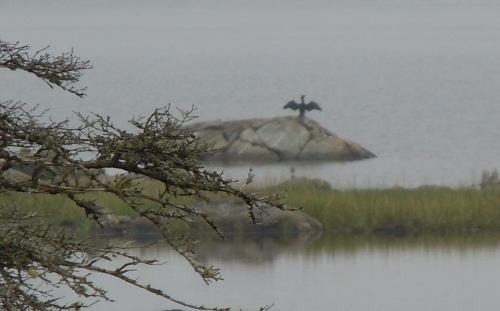 The cormorants certainly weren’t disclosing anything on that story. 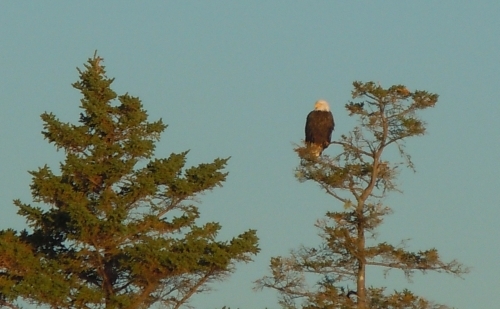 ‘We’ve been expecting you,’ the salt marsh sentinel announces from his roost at the top of the spruce. 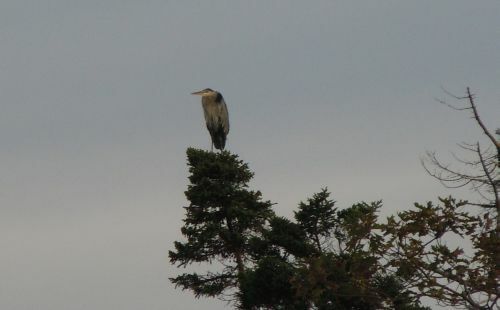 It’s the first time I’ve seen great blue herons perched high on the treetops. Though it all looks like business-as-usual in the marsh, there are always wonders waiting to be discovered. It’s good to be back. ‘I knew you’d understand,’ I tell them. 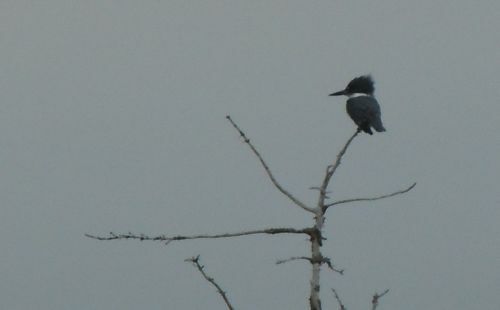 A kingfisher ‘s compact body finds a stable position at the end of a dried twig. I marvel at how expertly birds keep their bodies and lives in balance. In spring and summer their focus is on ensuring that the young ones survive to maturity. No hardship or sacrifice seems too great as they provide sustenance and safety to the next generation. But then, after giving their all for a season, they quietly revert back to concerns for their own well-being. Could it be because they carry no burdens in their hearts that they are light enough to fly such long distances to warmer climes? In storms and streams shave close and gnaw the rocks. Earth must dwindle, you see and take on growth again. 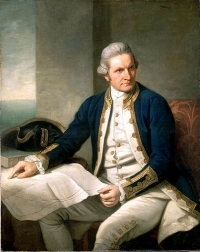 When Captain James Cook charted Cole Harbour on a map of Nova Scotia in the mid-1700s, it was wide and deep enough for tall ships to sail in and out. 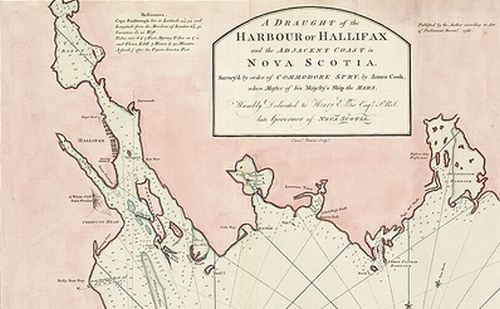 Though not as large as Halifax Harbour, it still saw its share of commercial vessels and privateers. 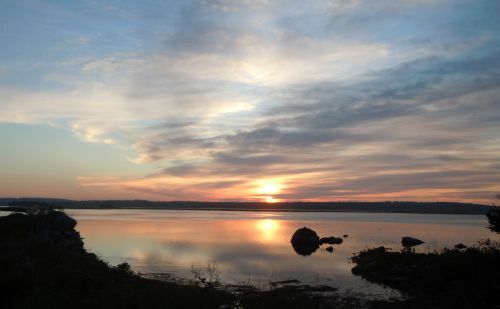 But over the centuries, shifting sands have narrowed the entrance to Cole Harbour. 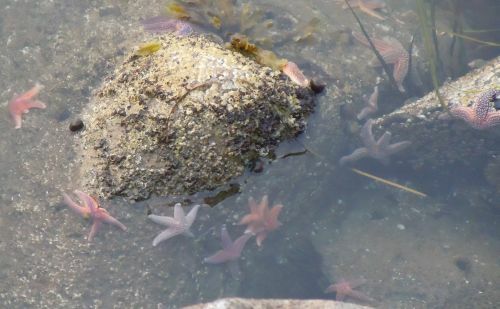 The harbour seems more like a marsh these days, leaving many residents to wonder about the exact whereabouts of Cole Harbour. Passage through the entrance is seldom undertaken by vessels of any size due to the strong currents. Though we might bemoan the recent evidence of erosion along Rainbow Haven Beach, in Cook’s time, this spit of land didn’t even exist. 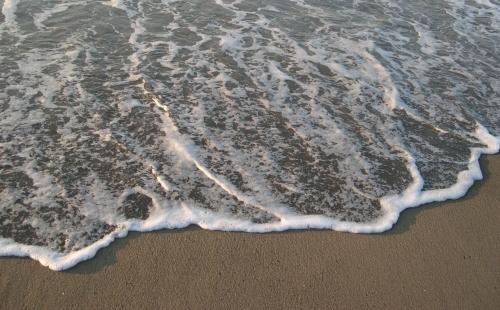 A coast line so irregular seems to fling a challenge to the great energy of the ocean. It hurls itself at the indentations to remove them – tearing down headlands, filling in bays. 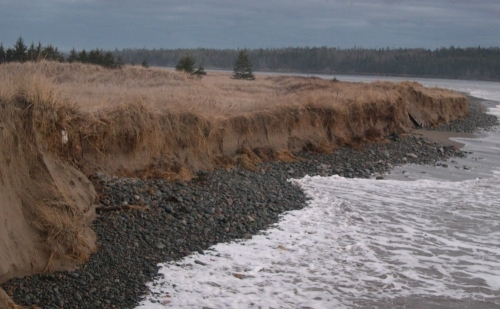 Hartlen Point west of Cow Bay and Osborne Head on its east are two drumlins presently being eroded by the sea. At the mouth of a bay, it seeks to build a fishhook shaped spit anchored on the curved shore with its point reaching toward the other, constantly growing, until in time it may close the gap. 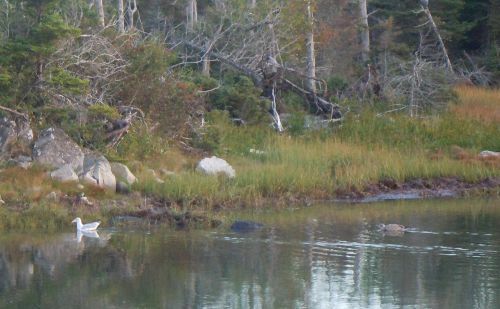 Then the bay becomes a protected lagoon which catches silt from streams, grows grasses, and thus traps more silt to eventually become marshy to dry land. Through centuries of toil, the powerful waves compounded such a barrier part way across the mouth of Cole Harbour. The increased frequency of severe storms in our area means we will see more rapid changes to our shorelines in the years ahead. While some beaches will suffer erosion, others will widen. The extent to which man can halt or alter these transformations is questionable. What is inevitable is that these changes will surely affect wildlife as well as residential, recreational and business developments along our coast. On February 17th, HRM will be hosting a Climate Change Workshop for Eastern Passage and Cow Bay residents. Details of the event can be found at Eastern Passage Online. 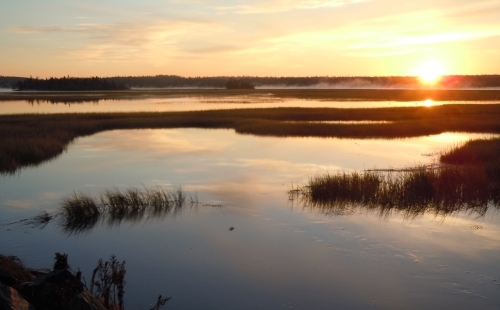 This weekend’s venue for the Fall Marsh Conference was the beautiful salt marsh in Cole Harbour, Nova Scotia. 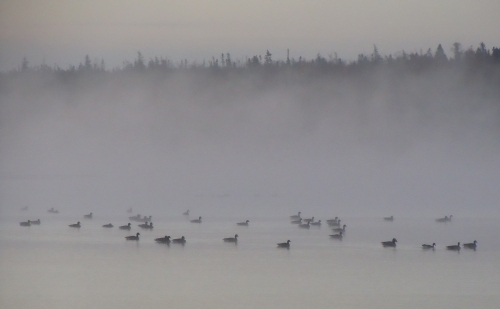 The location was ideal, as northern delegates such as the Canada geese were able to stop over to attend the events during their migration south. This year’s conference theme was The Tides of Change which gave all attendees opportunities to discuss strategies for the future while sharing lessons learned. A panel presentation facilitated by Dr. Bob Cat, entitled The Coyote Bounty: What it Means for the Rest of Us drew standing room only crowds, especially from the rodent delegation. Four workshops were also well attended: Innovative Uses for Discarded Tim Horton’s Coffee Cups, Coping with Off-leash Dogs, Managing Expectations for Migration Destinations after the Gulf Oil Spill and Winter Storm Survival Techniques. 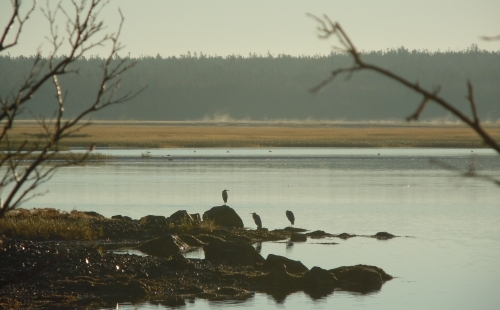 Once again this year, the sessions were coordinated by the great blue herons. A gala evening on Saturday featured music by the Sandpipers. Though the main vegetarian course was delectable, many of the attendees chose to find alternate fare off-site at the Roadkill Café on Bissett Road. This year’s keynote speaker was Dr. B. Eagle who provided some keen insights into life at the top of the food chain. It should be noted that conference organizers greatly appreciated his willingness to refrain from eating any of the delegates until after closing ceremonies. Thanks to all who worked diligently behind the scenes to make the conference a success! We hope to see all delegates again next year. You’ve been standing still for far too long with your feet in one spot … turning the same possibilities over and over again in your head. The days aren’t getting any longer and you’re not getting any younger. The time has come for you to spread your wings. Others may not approve and may even scowl at your need to do what moves you. Don’t let yourself be distracted by their expectations. Be brave enough to ask yourself what expections you hold for your own life. Be prepared for the unexpected. Thousands of geniuses live and die undiscovered — either by themselves or by others. 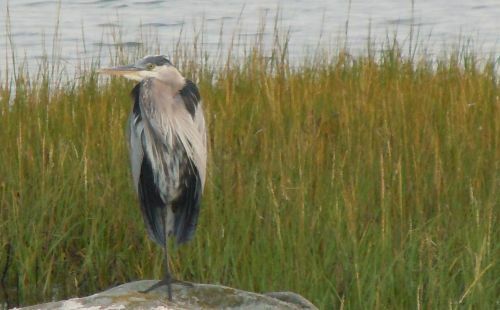 You may have felt the need for some time to stand on the rock and show the whole marsh world who you are. I’m no angel, but I’ve spread my wings a bit. On the other hand, your wing-spreading may be spurred by a growing desire to explore and employ your talents. How better than by using them could you express gratitude and praise to the One who gave them to you? Fear not. Don’t get rattled by the sound of the wind blowing through your feathers as you begin to spread them. 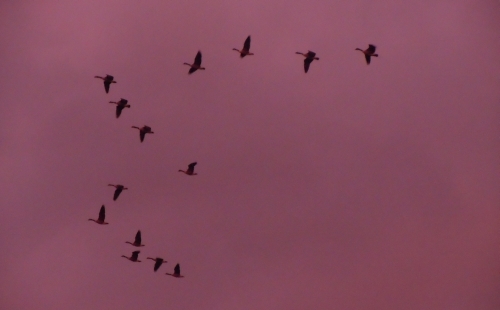 If you dare, others may even take your lead and follow with a little wing-spreading of their own. Setting an example is not the main means of influencing another. It is the only means. 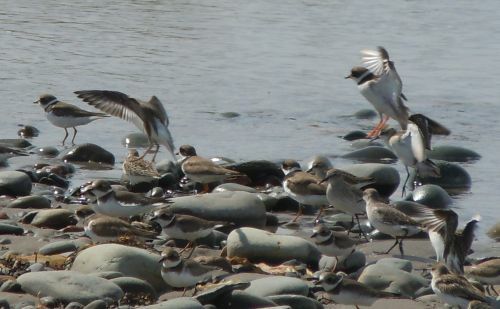 It’s a busy morning in the marsh. 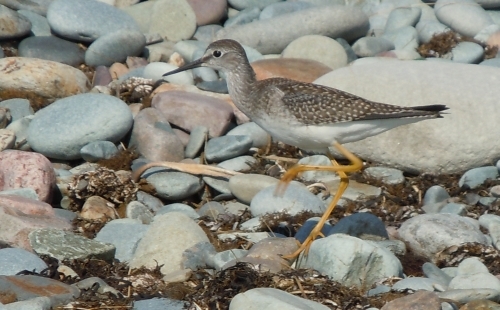 A sandpiper rushes across a stretch of sea-smoothed stones. If only we could make such sweet piping sounds as we take off in flight to meet our deadlines, Mondays wouldn’t be so bad. 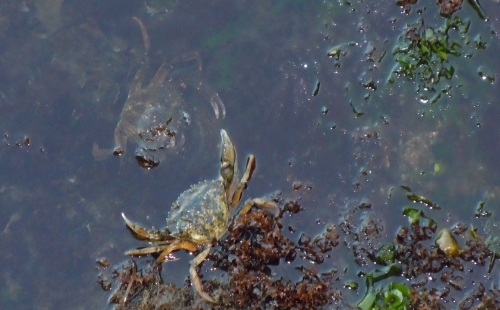 Crabs are sparring with one another just beneath the water’s surface. 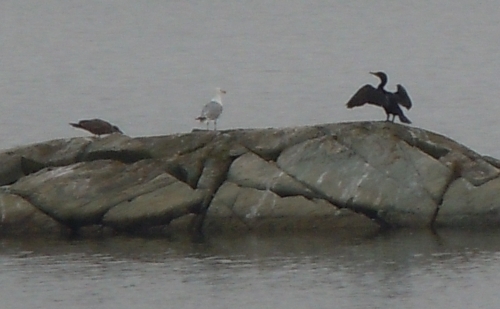 The disagreement is over almost as quickly as it’s started, and they respectfully move to their territorial rocks. Look at all those little fish. Surely there’s enough for everyone to share. 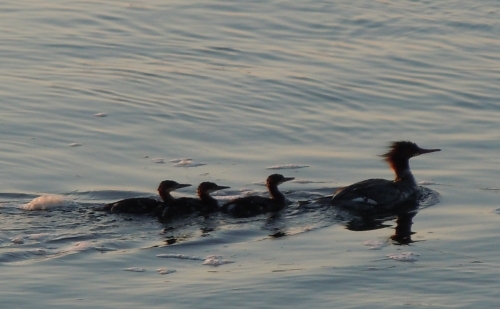 Mergansers have already had breakfast and are determined to stay close and tight as they move quickly to their next destination. 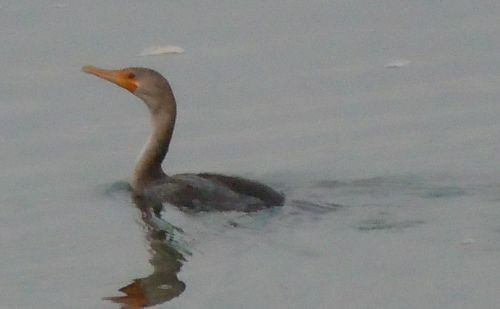 There are only three young ones left in a brood that might have had eight or more to start with. Things don’t always work out as planned, but it’s important to move forward and make the most of the day ahead. 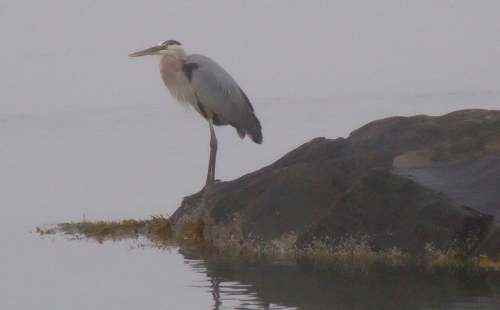 A great blue heron wrestles with a long fish. The bird twists its snake-like neck and turns its head upside down in order to get a better grip. It could certainly teach us a thing or two on the value of being results-oriented. 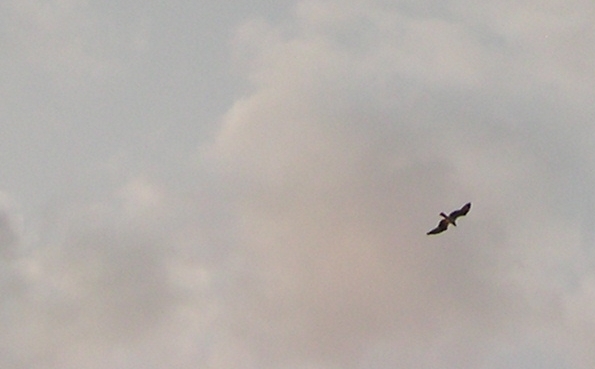 Sensing that I am getting much too close for comfort, it takes off with its meal in flight. 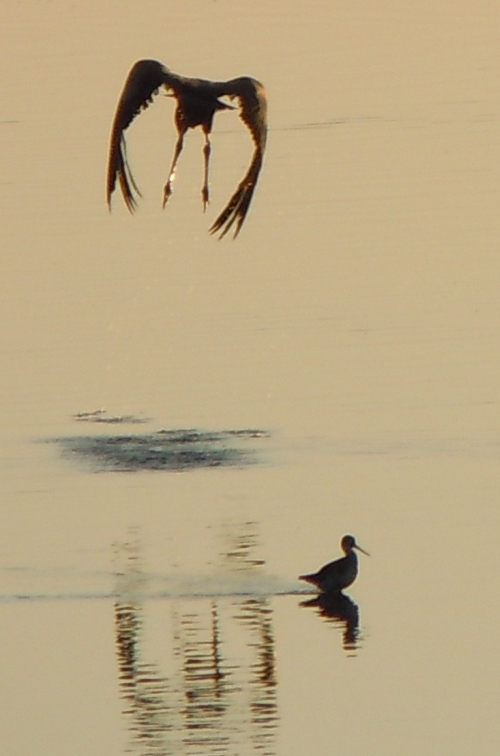 The heron below also takes off as I draw near. The sandpiper wading nearby doesn’t mind its ominous silhouette. It knows that things usually aren’t as scary and threatening as they might appear at first.